Why use inverter technology in ducted air conditioning systems? Inverter technology has vastly improved the efficiency of reverse cycle air conditioning systems. Rather than heating or cooling a room at full power and just turning off at the ideal temperature, inverter technology heats or cools the room and then maintains a constant temperature. What does this mean for you? This means a more comfortable space and system that is cheaper to run because it doesn’t use as much energy. Our systems are perfect in both new homes and older homes and air con installation can be done within a day for minimal disturbance to your household. 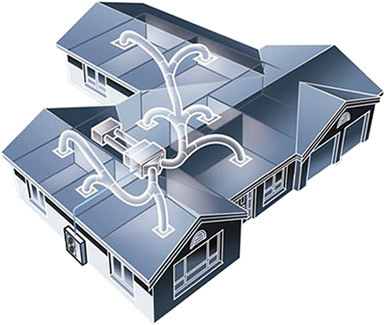 Our reliable and energy efficient LG and Daikin ducted systems start at $6,499. That’s our most competitive price all year round. Download one of our brochures today for more information and enquire about our FREE in-home consultation today. Why choose Air Conditioning Perth WA? All our ducted reverse cycle air conditioning systems have the ability to use smart remotes/controllers. with the latest E Zone or My Air 4 system software. Talk to one of our friendly professionals about the LG and MyAir smart controllers during your free in-home consultation and info on our air conditioning specials in Perth.